When a new employee joins the company, the HR Manager sends a formal mail to all the concerned departments to announce the new hire. It is a way of informing everyone about the new employee joining. It is quite a short email and contains basic details about the new employee. 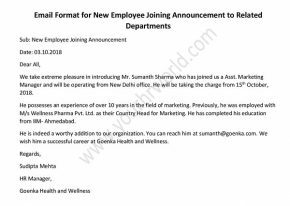 Just like Employment Joining Letter Format For Employee and new employee self introduction email, there are Announcement Letter Of New Employee Joining informing everyone about the new candidate who will soon be joining the company. Use this email template to announce your new hire to write a customized new employee announcement email with perfection. We take extreme pleasure in introducing Mr. Sumanth Sharma who has joined us a Asst. Marketing Manager and will be operating from New Delhi office. He will be taking the charge from 15th October, 2018. He possesses an experience of over 10 years in the field of marketing. Previously, he was employed with M/s Wellness Pharma Pvt. Ltd. as their Country Head for Marketing. He has completed his education from IIM- Ahmedabad. He is indeed a worthy addition to our organization. You can reach him at sumanth@goenka.com. We wish him a successful career at Goenka Health and Wellness. With havin so much content do you ever run into any problems of plagorism or copyright infringement? My site has a lot of unique content I’ve either written myself or outsourced but it appears a lot of it is popping it up all over the web without my permission. Do you know any ways to help protect against content from being stolen? I’d truly appreciate it.